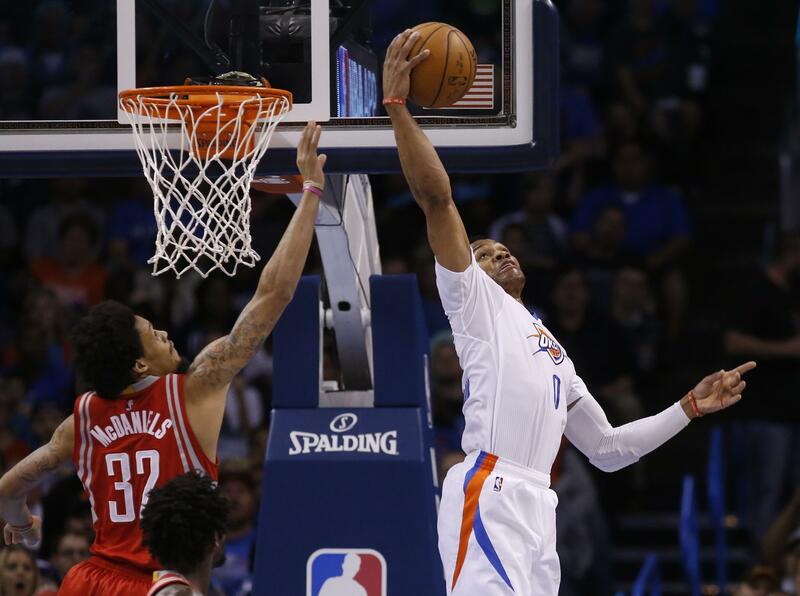 Tue., March 22, 2016, 9:09 p.m.
NBA: Russell Westbrook had 21 points, 15 assists and 13 rebounds to help the Thunder beat the Houston Rockets 111-107 on Tuesday night in Oklahoma City. Westbrook has 15 triple doubles this season and 34 in his career. It’s the most triple doubles by a player in a season since 1988-89, when Magic Johnson had 17 and Michael Jordan had 15. It was also Westbrook’s sixth triple-double in March. According to STATS, it’s the most by a player in a calendar month since Jordan had seven in April 1989. It was his third in a row and fourth in his past five games. Kevin Durant scored 23 points and Dion Waiters added 17 to help the Thunder win their fifth straight. L.A. to host 2018 NBA All-Star Game: The NBA All-Star Game is returning to Los Angeles in 2018. Staples Center will host the annual midseason basketball extravaganza two seasons from now, said NBA Commissioner Adam Silver. Los Angeles also hosted the All-Stars in 2004 and 2011 at Staples Center. The Los Angeles area will host for the sixth time overall in three arenas. Lawson to serve one year probation: Indiana Pacers point guard Ty Lawson will serve a year on probation in a Denver, Colorado drunken driving case after a judge rejected arguments that he needed to serve time in jail to learn a lesson. The former Denver Nugget was arrested twice on drunken driving charges last year – first in Denver in January and then in Los Angeles in July. He also has two previous DUI arrests that don’t count as prior offenses – one in North Carolina in 2008 for underage drinking and driving when he was 20 and another in 2011 in Missouri. Lakers examine allegation against Young, Clarkson: A Los Angeles Lakers spokesman says there are “different interpretations” about what happened during an interaction between players Nick Young and Jordan Clarkson and a woman who accused them of harassing her. Coach Byron Scott also says he spoke with the players about Sunday night’s incident in Hollywood with Alexis Jones, an activist and public speaker against sexual harassment and domestic violence. Jones claims that at least one of the two players gestured obscenely at her and her mother while the parties’ cars were stopped at an intersection in Hollywood, California. Mavs’ Parsons may return after right knee surgery: Mavericks forward Chandler Parsons is having surgery on his right knee again but might not be finished for the season. A person with knowledge of the situation said that Parsons was having arthroscopic surgery for a meniscus tear in his right knee but could return. The team said Parsons will not make the upcoming four game road trip because of the right knee injury, and coach Rick Carlisle declined to discuss the specifics. NFL: The Dallas Cowboys have agreed to terms on a two-year deal with running back Alfred Morris. The 27-year-old Morris started every game in his first four NFL seasons with the Washington Redskins, racking up 4,713 yards rushing and 29 touchdowns. Morris tormented the Cowboys, running for 710 yards and seven touchdowns in eight games against them. NFL owners approve new proposals: The chop block has been entirely outlawed from NFL games, and extra-point kicks snapped from the 15-yard line are now permanent. NFL owners voted in Boca Raton, Florida to approve both those proposals by the competition committee. They also passed a resolution to expand what is a horse-collar tackle to cover the nameplate on the back of jerseys. In all, seven rule proposals were approved. NHL: Alex Ovechkin scored his 43rd goal of the season and the Washington Capitals clinched the Metropolitan Division title and the top seed in the Eastern Conference playoffs with a 4-2 victory over the Ottawa Senators in Ottawa, Ontario. Mike Richards, Nicklas Backstrom and T.J. Oshie, into an empty net, also scored for the Capitals. Braden Holtby stopped 28 shots. Cammalleri to sit out season: New Jersey Devils forward Mike Cammalleri is not going to play again this season. Coach John Hynes announced that Cammalleri is not going to be able to play because of an injury to his right hand and wrist. He has not played since Jan. 26. Hynes refused to disclose the exact nature of the injury, but said Cammalleri would not need surgery. Cammalleri had 14 goals and 24 assists in 42 games. Miscallany: College Football Playoff executive director Bill Hancock said that it’s still “too soon to say” if any other adjustments could come to the event’s schedule. Hancock spoke at East Carolina University in Greenfield, North Carolina as part of the school’s annual sports business leadership lecture. The CFP earlier this month said it would move the Orange Bowl to prime time on Dec. 30 and start the New Year’s Eve semifinals one hour earlier. Television ratings for the Dec. 31 semifinals this past season were down about 35 percent from the 2014 season, when they were played on Jan. 1. N.Y. poised to end longtime ban on MMA: New York is poised to end its ban on professional mixed martial arts, the last state to prohibit the combat sport. Conducted inside a cage or other enclosure with a referee present, MMA bouts end when one fighter quits or gets knocked out or when judges decide after 15 or 25 minutes of fighting who the winner is. The New York Assembly left the ban intact for years over fears that the sport was too violent. Mid-American wins first NAIA championship: Malcolm Mann’s buzzer-beating layup as time expired gave Mid-America Christian its first NAIA national championship with a 100-99 victory over Georgetown, Ky., at a game played in Kansas City, Missouri. Trent Gilbert’s 3-pointer from the corner gave Georgetown a 99-98 lead with 4 seconds remaining. However, Mann darted down the court for the win with the buzzer flashing as the ball fell through the basket. Devonse Reed scored 25 points and Mann finished with 23 points for Mid-America Christian (28-9). Noah Cottrill scored 32 points for top-seeded Georgetown (32-4). Published: March 22, 2016, 9:09 p.m.